Even though we all want to be happy in theory, we don’t always give ourselves permission. Why would we do that? Because happiness is considered to be dangerous. Although every one wants to feel good, we fear that being happy will pacify us and ultimately destroy us. Unhappiness is like an abusive lover that we’re afraid to leave because we don’t believe in our ability to get through life successfully without having him in our lives. We’re afraid to love our lives as they are because we fear being stuck with an unwanted condition. If we allow ourselves to be happy NOW, even though we have some things going on that we don’t like, we fear we might become complacent. To many people, being happy no matter what sounds identical to settling for less. On the surface, it seems so much more responsible to analyze what’s wrong than to appreciate what’s right. Appreciation might be the moral thing to do, but who wants to get stuck with a mediocre life? So we dismiss appreciation as a waste of time and dive right into the bad stuff. After all, that’s what we’re trying to get rid of, right? So WHY NOT focus more on the bad stuff? Well, contrary to popular belief, appreciation is not just an act of maturity. It’s an act of creativity. When we highlight and emphasize what’s good about our lives, we ascend to a level of consciousness that empowers us to create more of the same. There are some who would have you believe that you shouldn’t be happy as long as there are things wrong with your life or the world. This idea is based on the notion that happiness is just a fleeting emotional sensation. At its deepest level, however, Joy is a creative force. When you feel good, you are in alignment with the very energy that creates worlds. And no state of being is more powerful or productive than that. 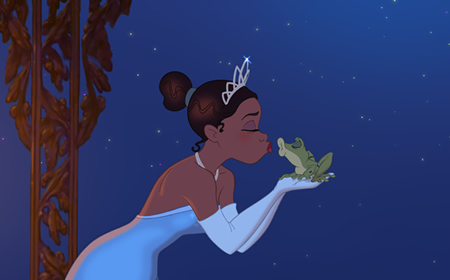 Waiting for your life to improve before you choose to be happy would be like the princess waiting for the frog to turn into a prince BEFORE she kissed it. It doesn’t work that way. At some point you just gotta pucker up and love all the ugly aspects of your life. Because you enjoy kissing frogs? No! Because your prince is trapped inside of there and you’re not going to let “being grossed out” keep you separate from him. But you’ve gotta kiss the frog FIRST. “I aint kissing that bleeping frog”, you may be thinking. Well you don’t get to see the prince of your dreams until you chuck it up and kiss that ugly thing sitting over there. “I’ll really live life once it becomes lovable” we think. But you have to love your life until it becomes livable. That’s what tough-minded optimism is all about! I ended my last post (click here to read) by mentioning the power we have to promote problematic people and situations to a more useful function in life through the making of slight adjustments in perspective. Let’s continue following that train of thought. You are free to be my enemy. I cannot control your freedom of choice with my thoughts. But I am free to process my personal experience of you in whatever manner I choose and it is this choice, alone, which determines my fate in life. What is often left out of most discussions on dealing with unwanted people and conditions, is the sovereignty we maintain in how we “process” our experiences. “Processing” refers to a set of activities which include interpreting what a given event means, assessing the value it has, determining what its relationship is to other elements in one’s life, and deciding what kind of response best fits the situation. Understanding the options available to us in the “processing process” is the key to realizing the limitless extent of our creative power. More specifically, in this context, “processing” is the primary tool we use to maintain the control necessary to alchemize the personal and circumstantial enemies in our lives. In the Book of Genesis, we are told the story of Joseph, the boy who wore the coat of many colors. As a child, his heart was filled with many wonderful dreams. But his brothers envied him and sold him into slavery. They stripped him of his prize coat, poured the blood of an animal over it, and concocted a story of how he’d been killed by a wild beast. While most people would have been emotionally and spiritually defeated by such a cruel act of betrayal, Joseph kept his focus on well-being. Joseph had been stripped of his material coat, but that was only a temporary outer symbol of his inward ability to colorfully clothe the unwanted conditions of his life with creative thinking. Joseph understood this great principle of thinking in harmony with the laws of well-being. This philosophy is not a matter of letting people run over us. Nor is it a lesson which promises that we will be loved by all people. This is a powerful dosage of esoteric wisdom which reminds us of the divinely endowed ability we have to transform our reality through the creative power of thought. When we affirm autonomy in the face of adversity; and confess order in the presence of opposition, then we summon only those qualities from others that find agreement with our harmonious thoughts. In this way, we “please the Lord.” When we “please the Lord”, those people, places, and conditions which once seemed to work against us will take on a new function. Though they may swear against our joy, they will be the very instruments by which that joy is obtained. There’s an old saying “if you can’t beat them, join them.” Well, the reverse is also true. If someone can’t beat you, then they must join you. If you let no one defeat your joy, then they must become a contributor to your joy, whether they know that’s what they’re doing or not. That’s just how powerful you are when you think in harmony with the Divine Order that exists at the very center of your being. That’s my two cents. How do you intend to invest that? Is it possible to live above life’s turmoil? To be IN the world but not feel dominated BY the world? To fully engage the whole of life without self-compromise? To do work one feels called to do and be of meaningful service to society? To love AND be loved? To know power as an innate quality and creativity as a birthright? To face fears with a sense that there’s a Divine Spark within us that can never be extinguished? In this moment, let us center our awareness in a consciousness of the Divine Reality. Let us affirm that our being is rooted in God’s being and only that which is expressive of Infinite Good has place in our lives. As we invite the energy of compassion and creativity to be our constant companions, the floodgates of peace and prosperity are opened mightily in every direction. I live, move, and have my being in a Boundless Ocean of peace, possibility, and prosperity. The Living Waters of Infinite Good are flowing through me now and my soul is refreshed. I am riding the waves of Spirit as I joyfully surf along this powerful Stream of Well-Being! Today I open my heart to the endless bounty and infinite beauty of this magnificent Universe. I join hands with the forces of good and through this connection I am empowered to create, encouraged to love, and excited to live. I bless every APPEARANCE of lack and conflict in my life, for they are not here to harm me. They are wonderful teachers and delightful gifts. They are here to teach me how to look beyond the APPEARANCE of things into the spiritual REALITY of Unconditional Love that lies behind all. As my vision of this REALITY intensifies, I draw more of its energy into my experience. All is love. My heart is open. There are no threats. All is well. Behind the appearances of chaos, confusion, and conflict is the unchanging and invincible reality of Infinite Peace. I choose to live in this realm of unquantifiable abundance & unlimited wellness! I look beyond all forms and manifestations towards the limitless potential of Unmanifest Being. My attachment to outcomes is now released as I place my faith in that which is beyond my ideas and expectations.